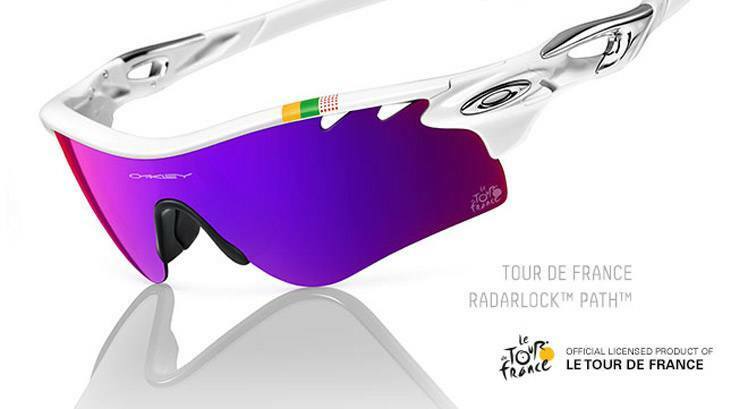 Tour de France 2014: Oakley TDF Special Editions (RadarLock Path & Racing Jacket) – Now Available! The 2014 edition of the Tour de France is well underway with the first 3 stages in the UK now complete – We now move on to France for the 4th stage with a 163.5km route from Le Touquet-Paris-Plage to Lille Métropole. Unfortunately for us, Mark Cavendish is out of the tour due to his crash in the first stage so all eyes are now on the remaining Brits! Oakley have released 2 special edition Tour de France frames to their Heritage collection. Both are perfectly designed for cycling and MTB activities and can be fitted with Oakley True Digital lenses upon request (new online OTD system coming soon to SelectSpecs.com!). You can buy these now, check them out below. OAKLEY RADARLOCK PATH TOUR DE FRANCE PECIAL EDITION 2014. Listed at the top of page. RADARLOCK PATH 30 YEARS SPORT EDITION SUNGLASSES ? If so, what is my COST ? Shipping to 63026 MO. Tour de France 2014: All Eyes on Chris Froome and Mark Cavendish as the action gets underway! Seriously, why are you still using the high street for designer prescription glasses? Shop online and save up to 60%!